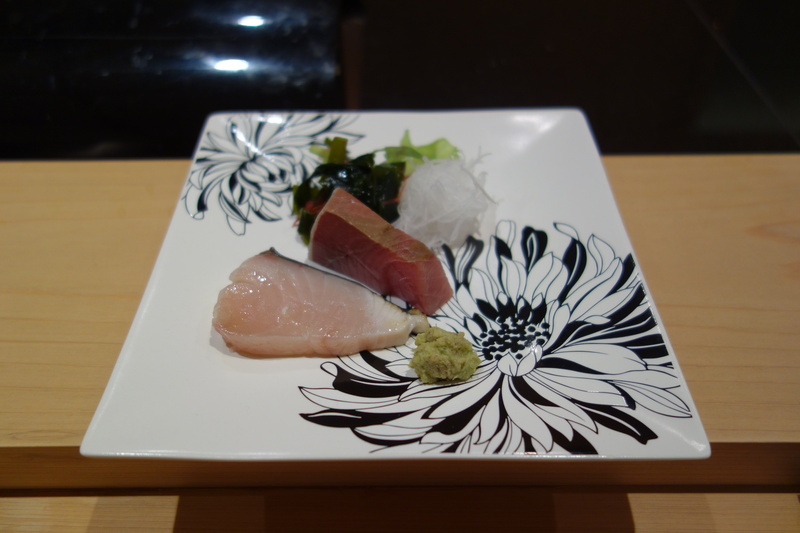 The good and the bad are intimately co-mingled at Sushi Mitsuya. 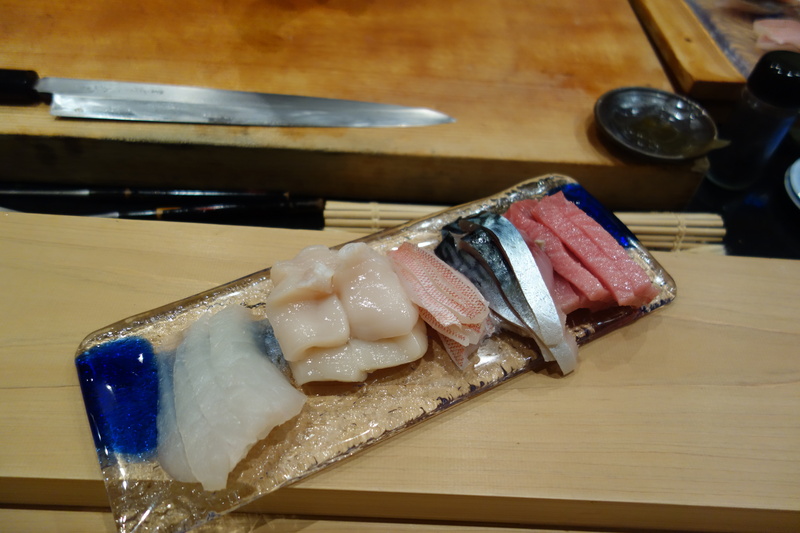 Here, Chef Harada makes a sincere effort to educate the Singapore sushi diner – while the usual trappings of luxury are present (otoro and chutoro resplendent), unfamiliar varieties such as tsubugai (sea whelk) and kamasu (barracuda) are also available. 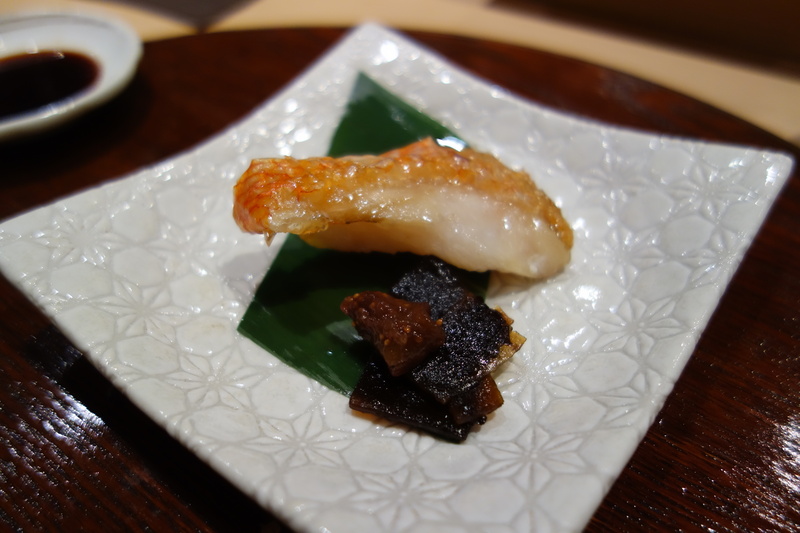 The seafood here tends towards esoterica, and the otsumami (appetizers and sashimi) were noticeably better than the sushi. 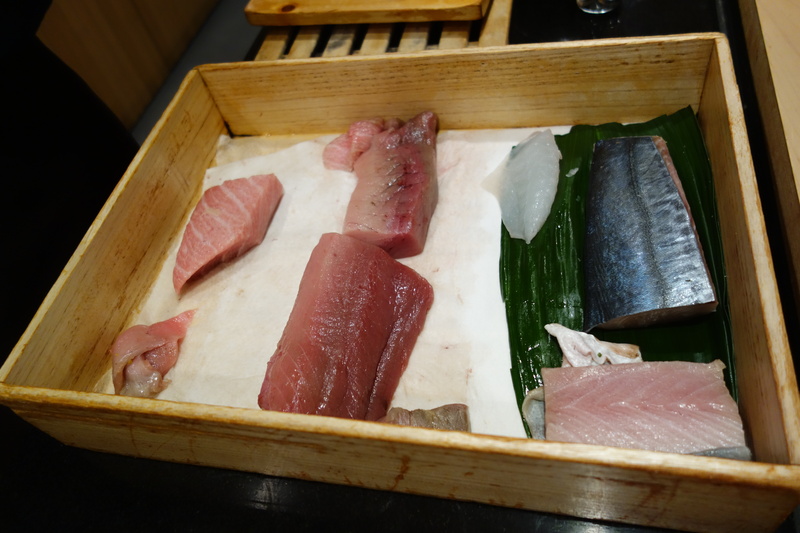 The highlights from this dinner were two: a keiji maguro (infant tuna) that balanced meat and fat; and a sawara (Spanish mackerel) that bridged the seared and raw. 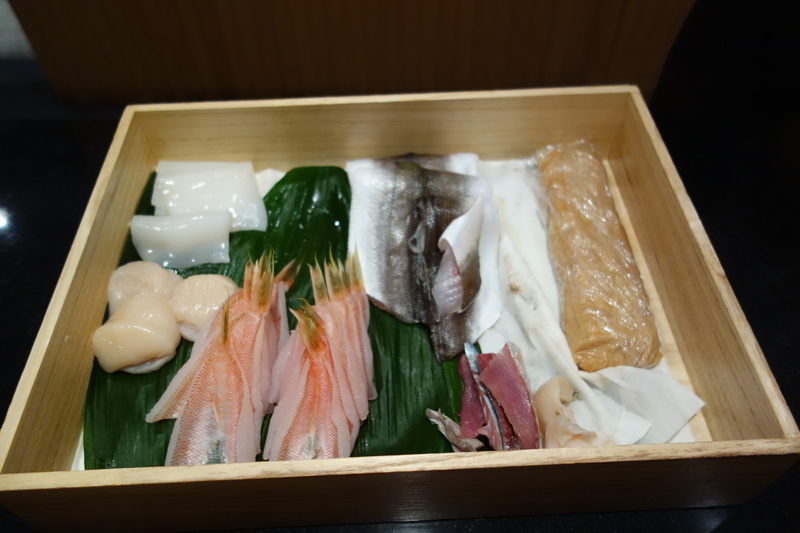 While dining with my friend (someone who has been to Sushi Mitsuya more than 10 times), I gathered that Chef Harada’s cuisine travels in 3 directions. 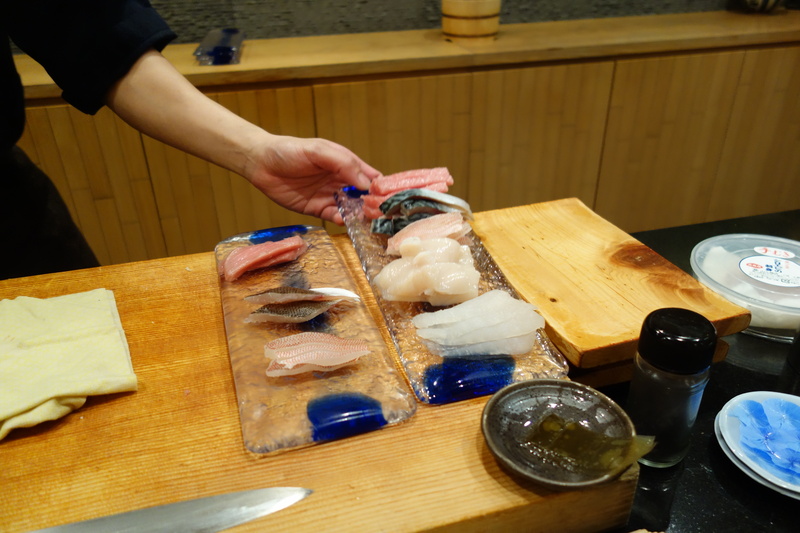 The first is the aforementioned consumer education, a dedication to bringing unfamiliar varieties to the Singapore sushi market. 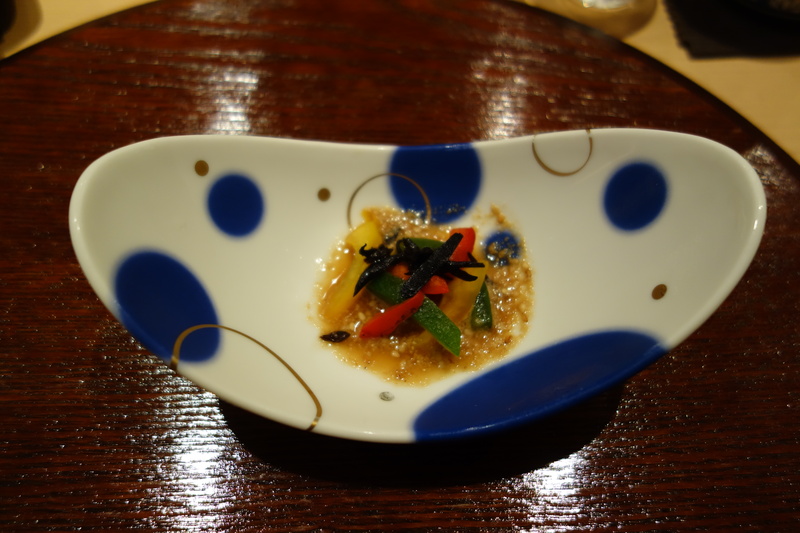 The second, evident in this meal, was a focus on rich, unctuous flavors – from the starting bite of seafood (a kawahagi wrapped around its liver), to the aged buri, to a delicious onslaught of tuna, we were served at least 6-7 dishes of rich fish, which ended with the piece-de-resistance, a bowl of rice topped with chopped otoro and ikura. 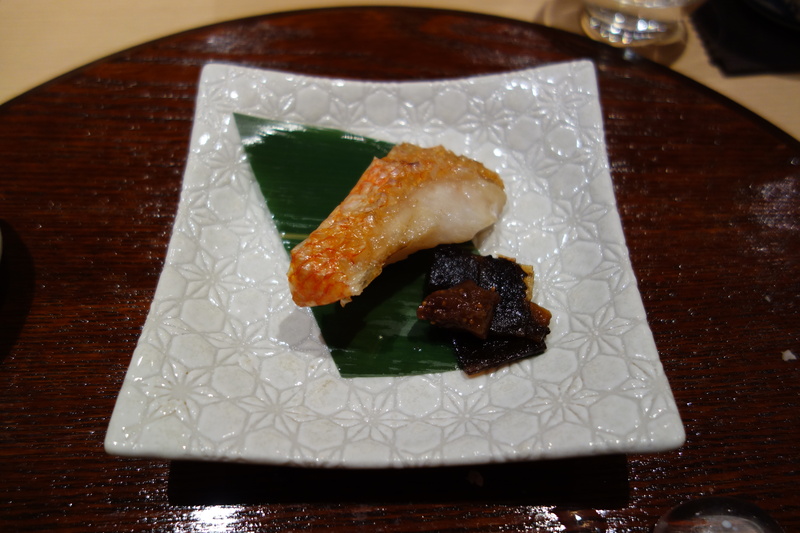 The third, less evident in this meal, is a love of shellfish. 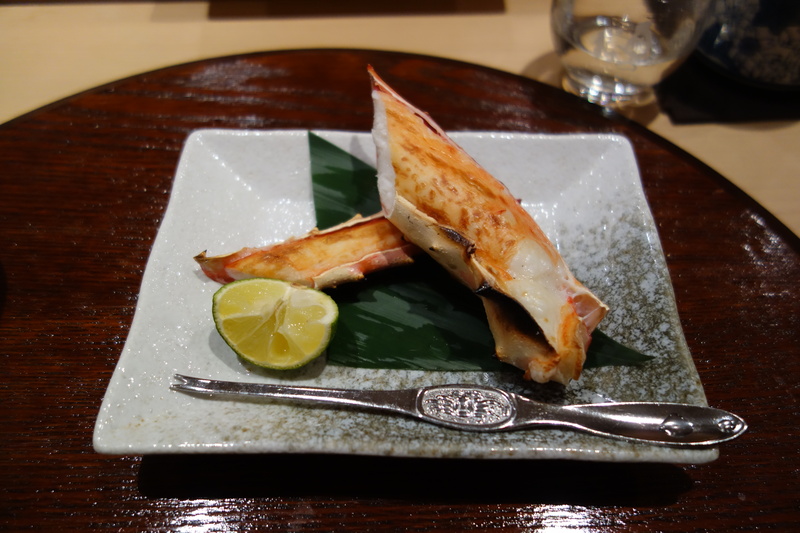 We were only served the tsubugai on this visit, but according to this report by Brandon Chew of Chubby Hubby, larger varieties of shellfish are available on request. 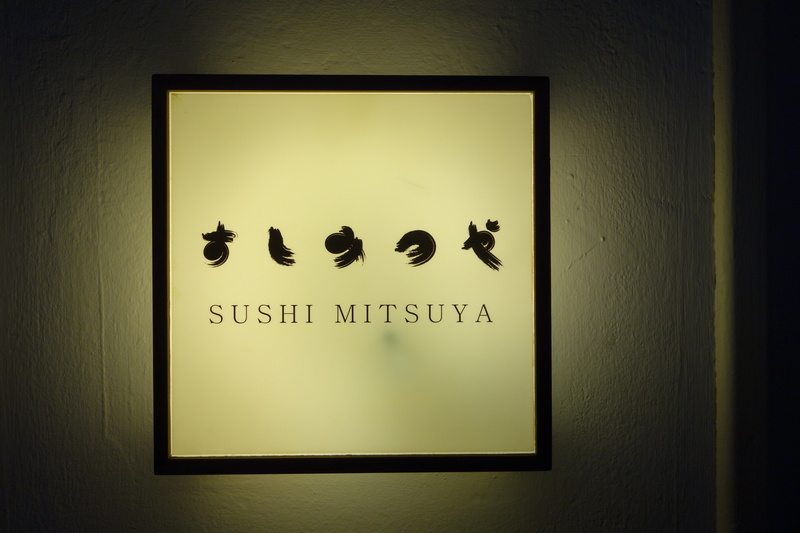 If it ended at where my chopstick-pushing and sushi-picking fingertips ended, Sushi Mitsuya would be a very good restaurant. 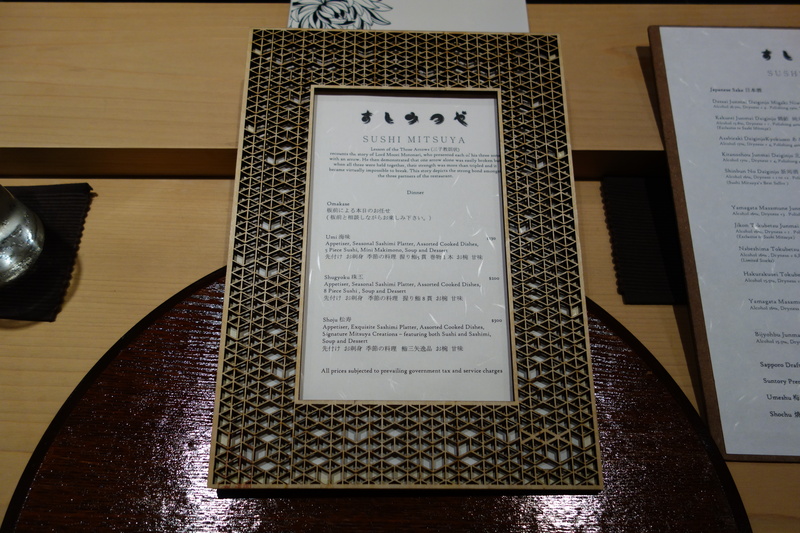 Not one, perhaps, worth $400, but certainly $150-$250 would seem reasonable and commensurate with Tokyo prices. Unfortunately, the entire package of Sushi Mitsuya is compromised in at least three ways. First, there is the clientele. What a clientele! From two middle-aged men who took out their Macbooks after the meal, and played videos of their golfing trips at a high volume right next to us, to the plumply amorphous Singaporean/Malaysian woman, who, bespeckled with rings and earrings glittering in a most Dolores Umbridge kind of way, proclaimed in a voice loud enough for the entire bar to hear that she is a “regular”, and then painstakingly accounted for her visit frequency. No doubt she repeats the same charade for every visit. I would not wish these boorish “regulars” upon my worst enemies. Faced with this carnival of more money than sense, Mr Harada must play the disciplinarian at his sushi bar without alienating his moneyed customers. 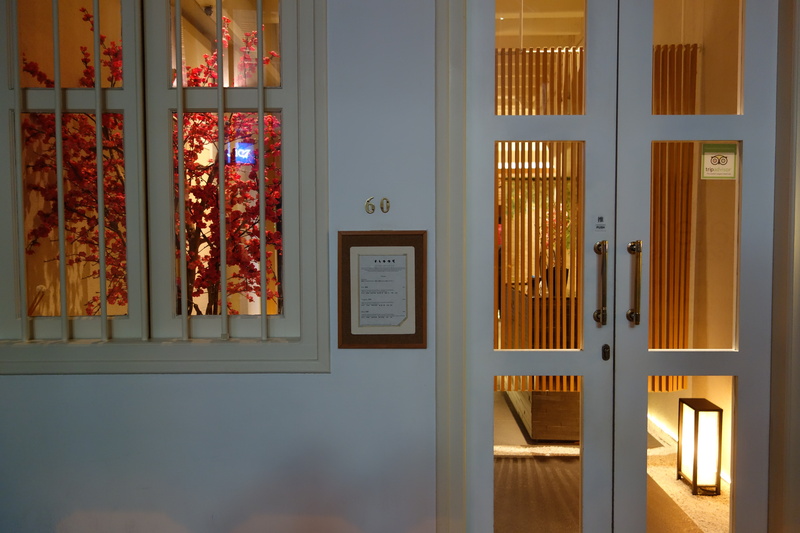 He is largely ineffectual, but he does possess a fallback – an impressive Buddha-like patience, perhaps honed at Sushi Sora at the Mandarin Oriental in Tokyo, where he was last. 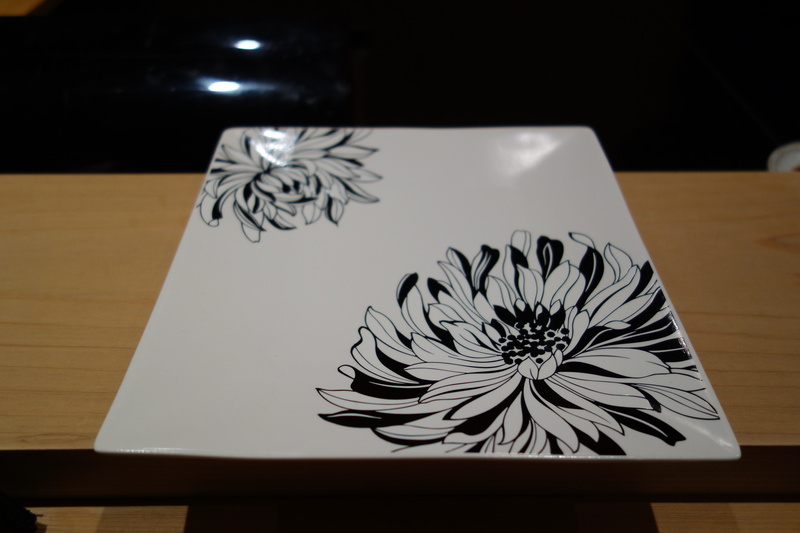 The second and third compromising factors I question about a self-styled edomae place. 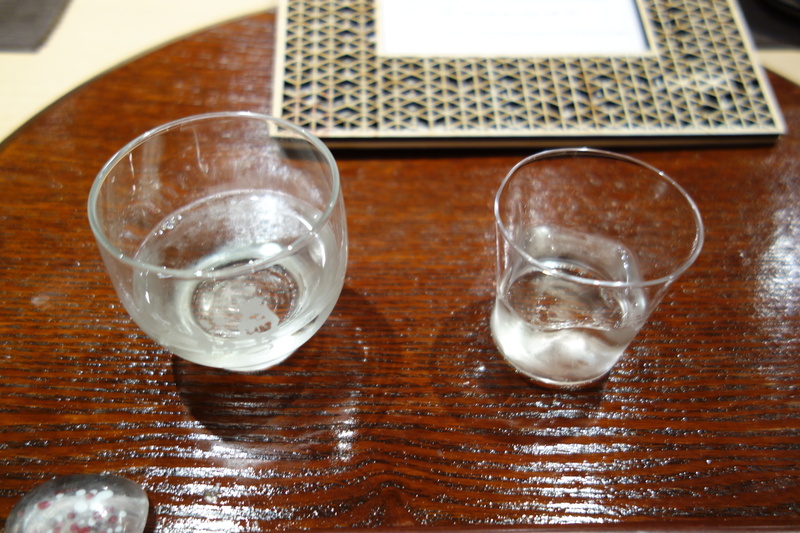 The second factor – Mr Harada doesn’t serve everybody. 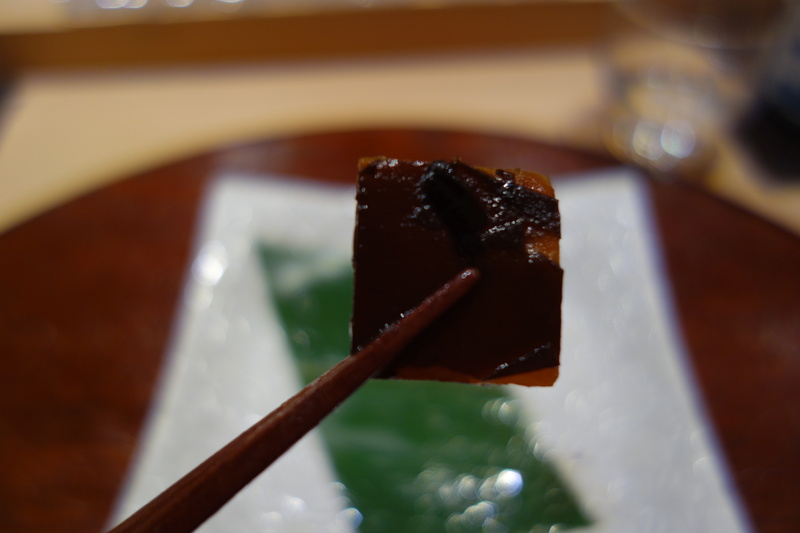 We did not get any sushi made from Mr Harada’s hand, instead coming from his assistants. 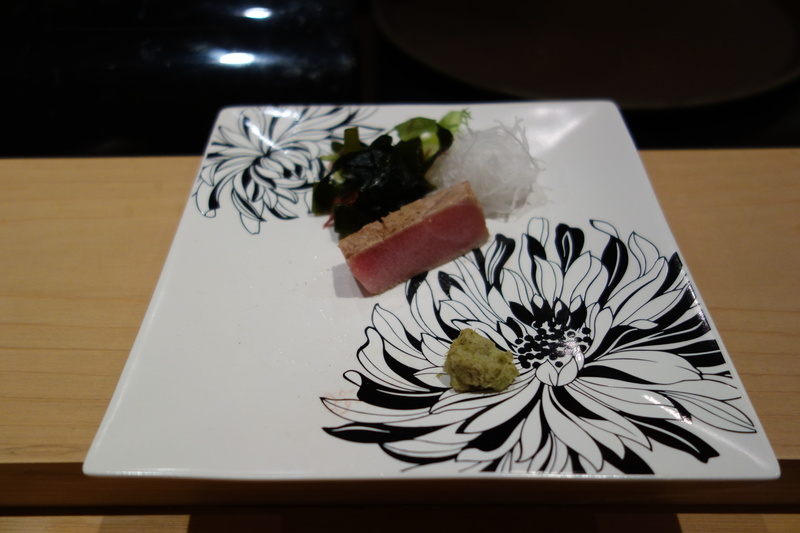 I was expecting at least some sushi made by the head chef. 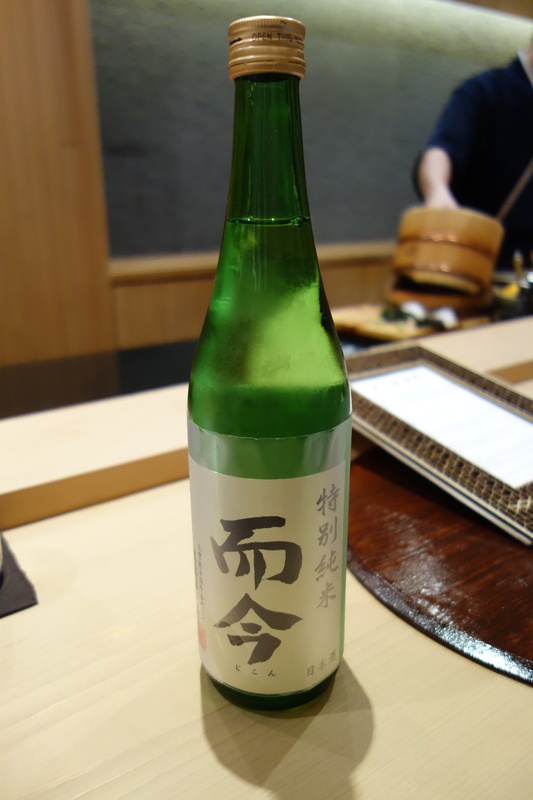 We came in at 830pm on a Friday, and were the last seating, but already Mr Harada had closed up shop for the night, and was sharing a glass of red wine with his regulars at the corner of his bar. The third factor, which follows from the second, is the lack of attention to detail. 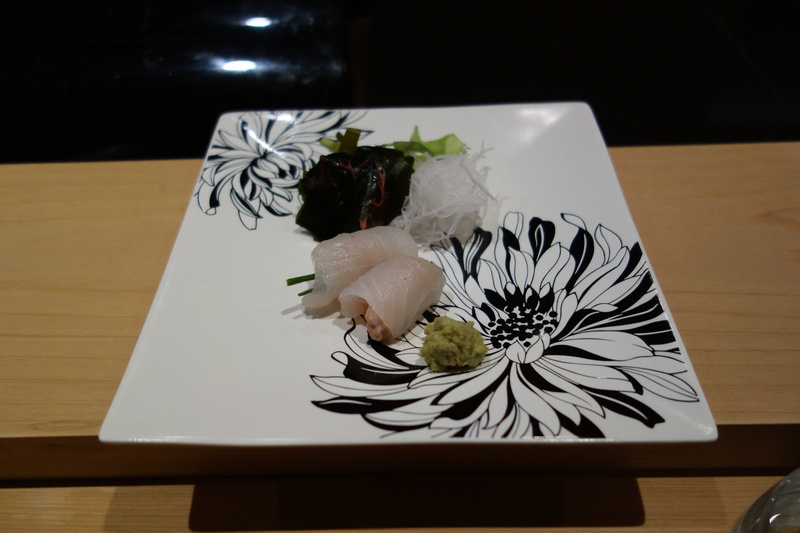 Some of the sushi lacked refinement – the anago for instance felt undersauced. The apprentice cutting up the ika double-scored the squid in such a hasty way that you could see the tentacle fibres being pulled up by the knife. 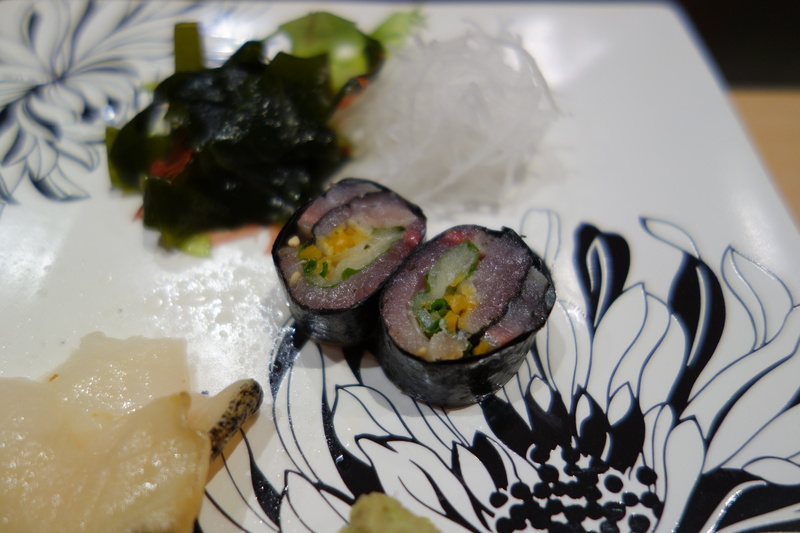 (we did not have the squid so I can’t comment on what impact the rough knife skills had culinarily). 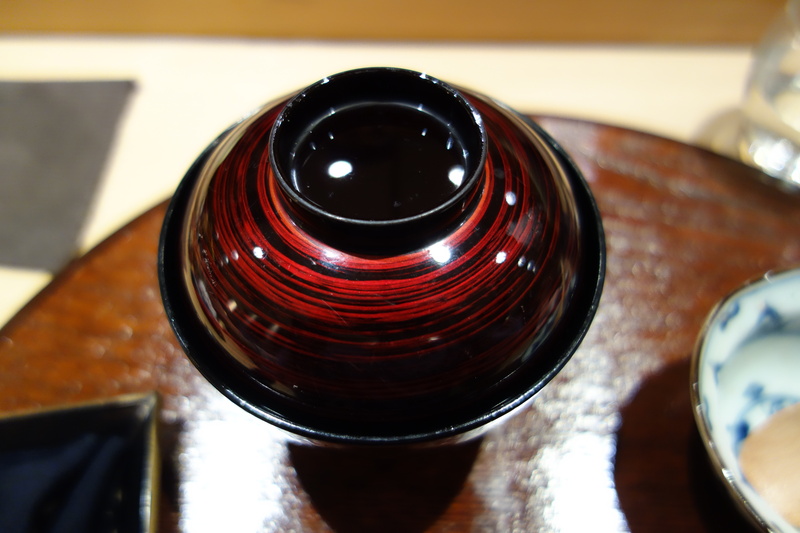 It was a huge contrast with Kojyu last month, where Okuda made measured, rhythmic cuts into the ika. I was surprised that such haste would be displayed in full view of the patrons, but then again perhaps I was the only one who cared. Why the haste? 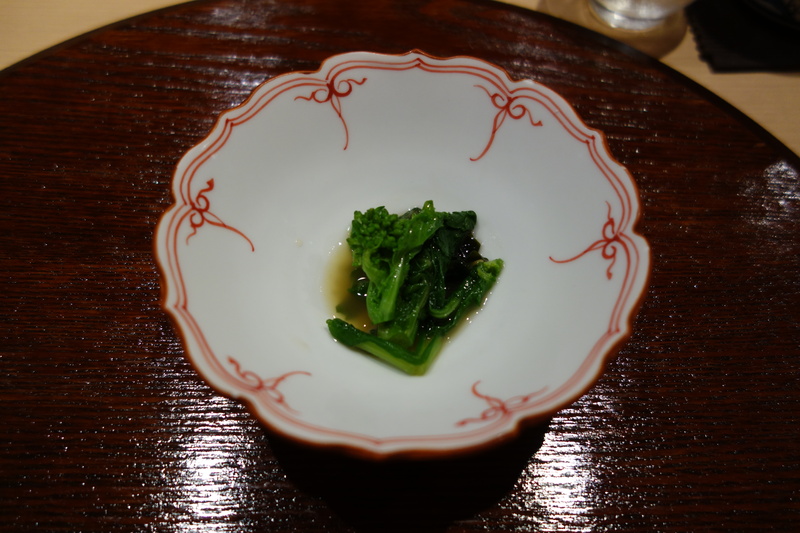 An earlier plate of romanesco broccoli served with ankimo was hastily served to our positions by the apprentice – the romanesco broccoli fell down, and had to be re-righted. 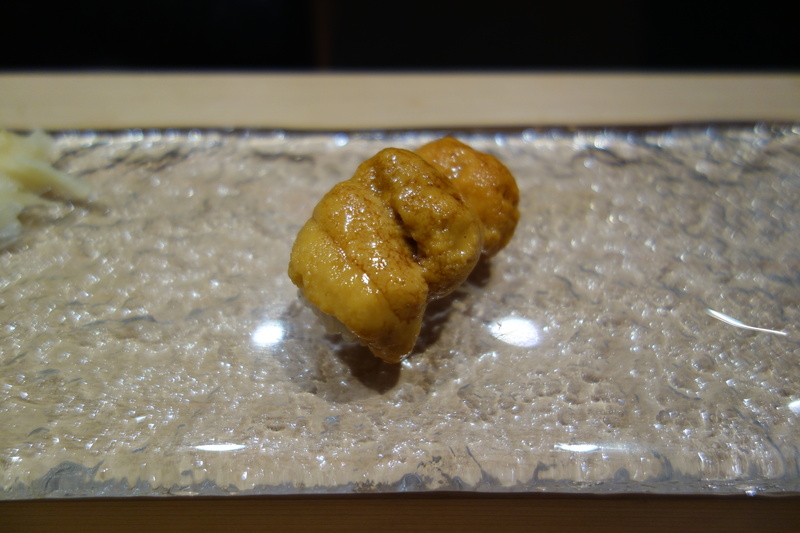 Another point, which may seem minor, but is unbecoming of a top-class restaurant. 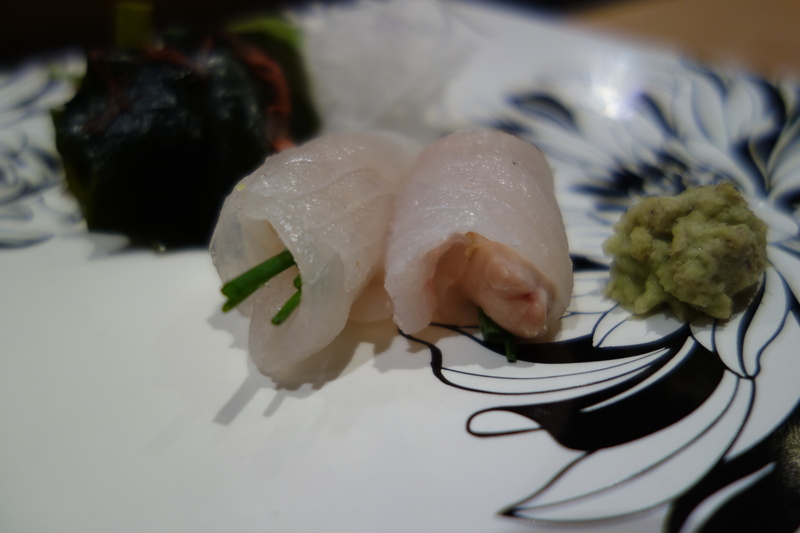 Even though the wasabi was grated by a sharkskin grater, our otsumami was served with wasabi that had been pre-grated sometime earlier, and which had noticeably browned (you can see it in my pictures). 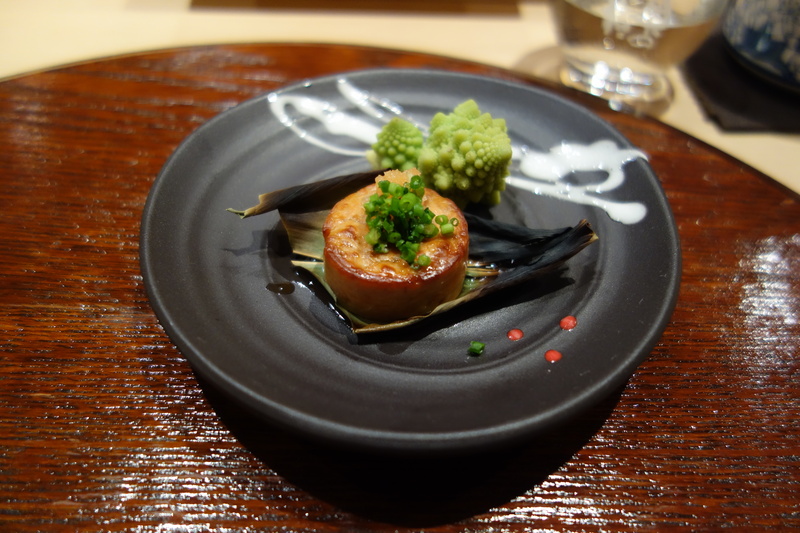 If you are serious about serving wasabi, it seems weird that you would go through all the effort to procure fresh wasabi, grate it with sharkskin, but then serve your clients wasabi that had been pre-grated some time earlier. I found the lack of attention to detail surprising, especially in a restaurant charging prices the envy of any 3 Michelin star restaurant. 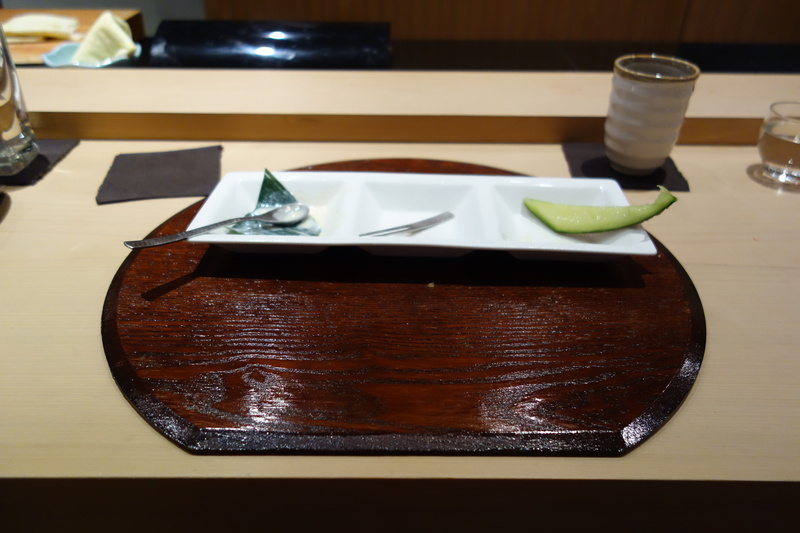 I felt it strange that Mr Harada doesn’t make any sushi himself. I do not mean to single out his assistants/apprentices (who are after all learning), but why does the head chef have such a hands-off attitude towards the preparation of his food? 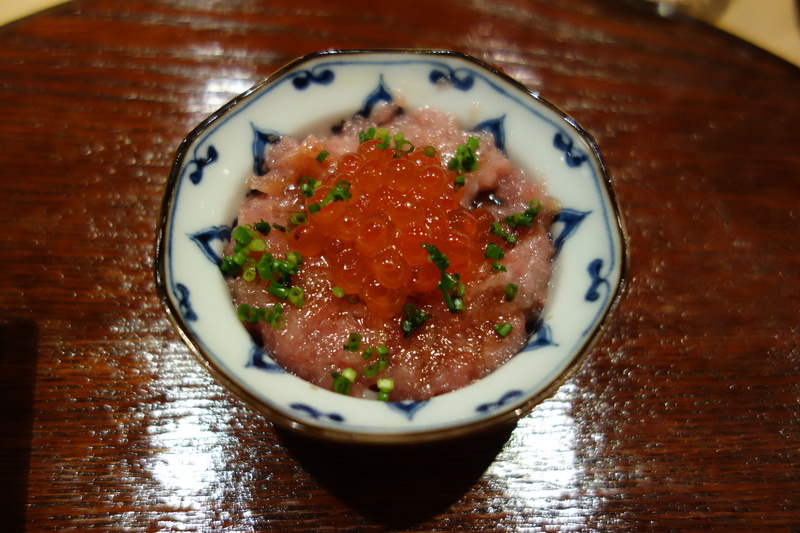 Mr Harada is a young chef, and clearly talented in preparing his carefully sourced food. 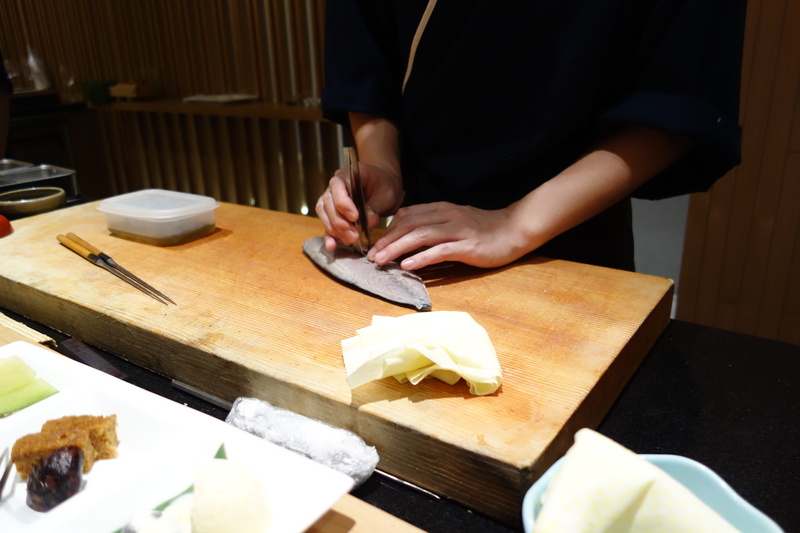 But he should take a more hands-on approach to preparing his food, and ensure that his fish is cut with care, his wasabi freshly grated, and his food carefully presented. 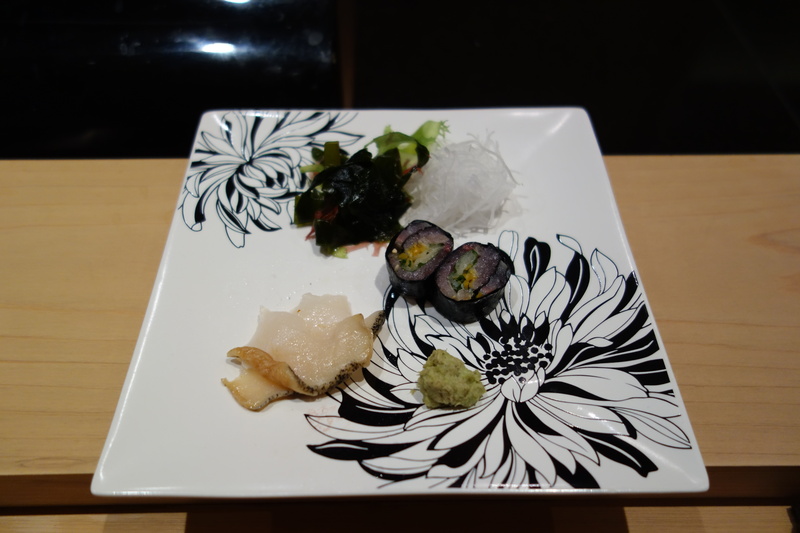 These mistakes detract from the experience at Sushi Mitsuya. 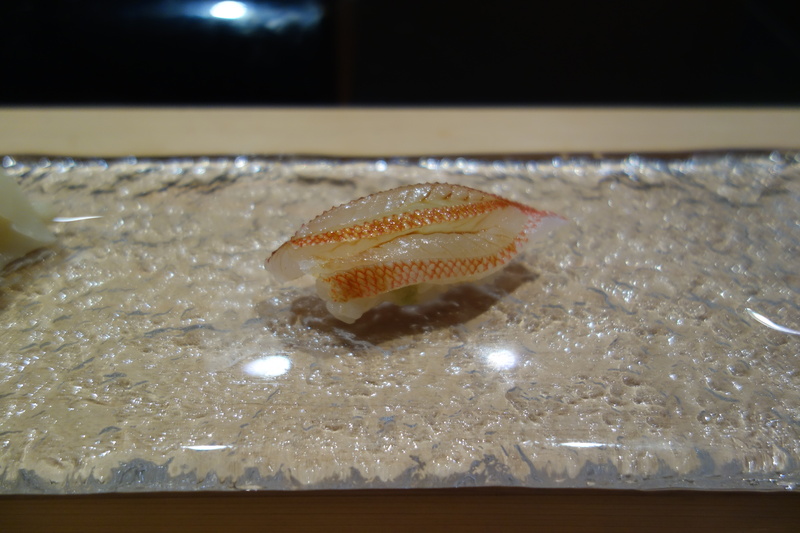 The filefish sashimi is very similar to fugu, both are sashimi with little taste, with a springy texture that can only be conquered by biting with the molar teeth. Its liver is a quavery semisolid, which the first verdant sharpness of spring onion contrasted with. 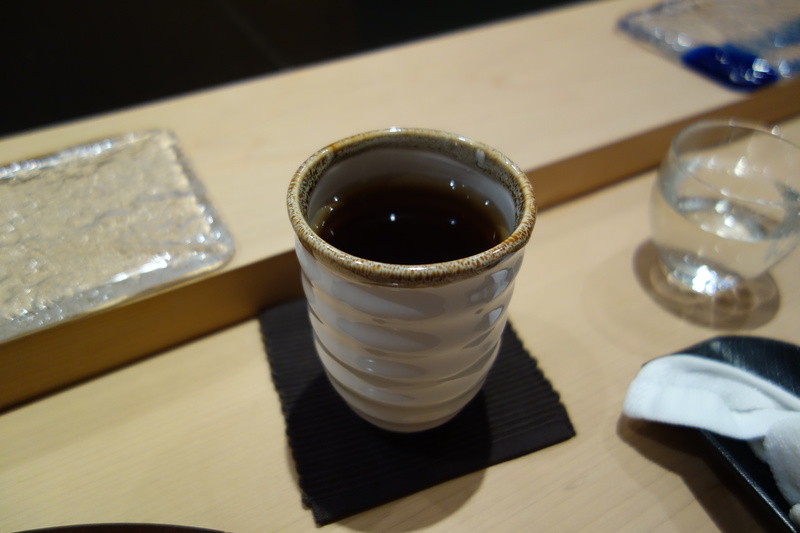 Tough, crunchy, very earthy flavor. 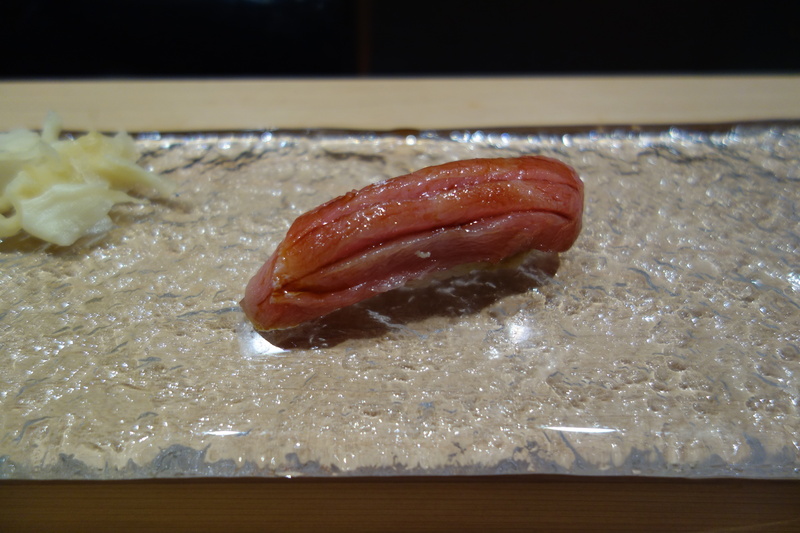 From the texture I would guess it had been sliced lengthwise (which apparently leads to harder texture) Needed soy. 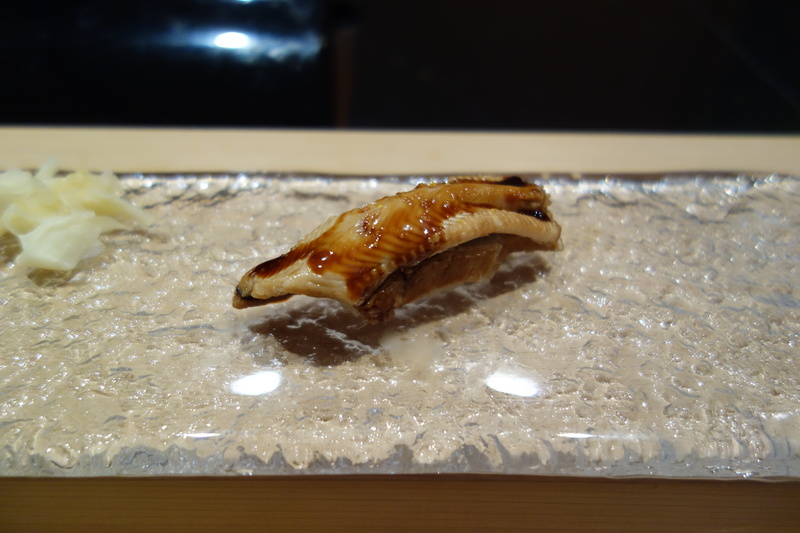 Cooked in a leaf. 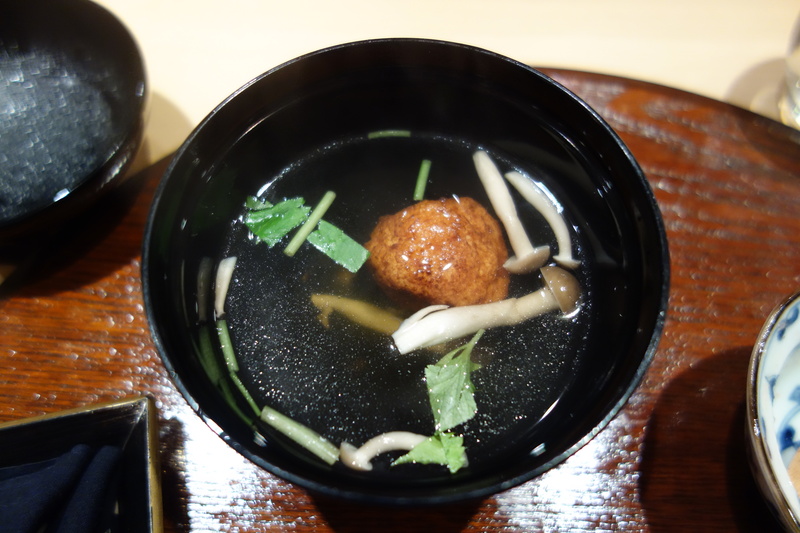 The puck of ankimo was a rich bite. 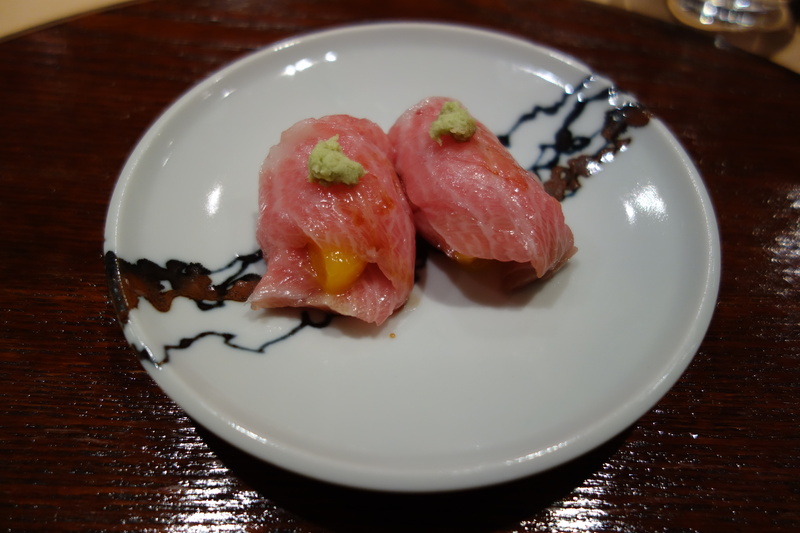 First, the otoro (a repository of fat held together by a few filaments) touches your tongue, and then a creamy explosion comes from the miso-marinated egg yolks. The bite brings to mind an “unending creaminess”. 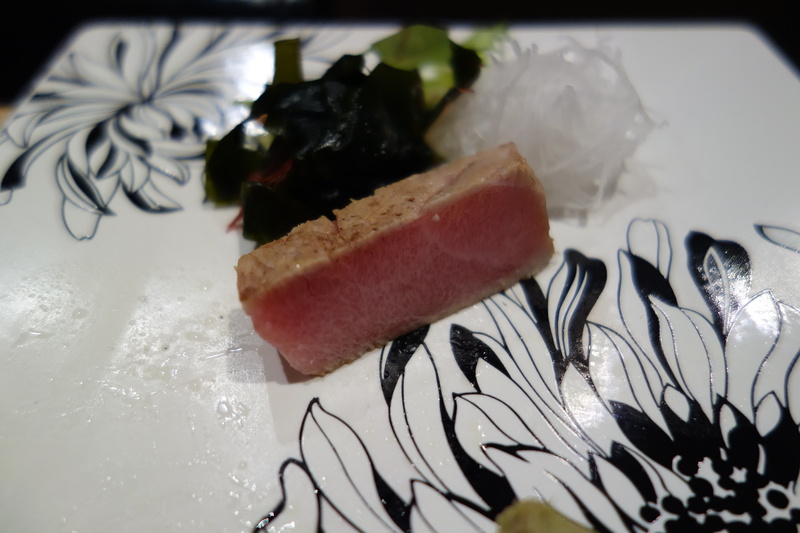 It was served with the keiji maguro. The contrast between the two was instructive. 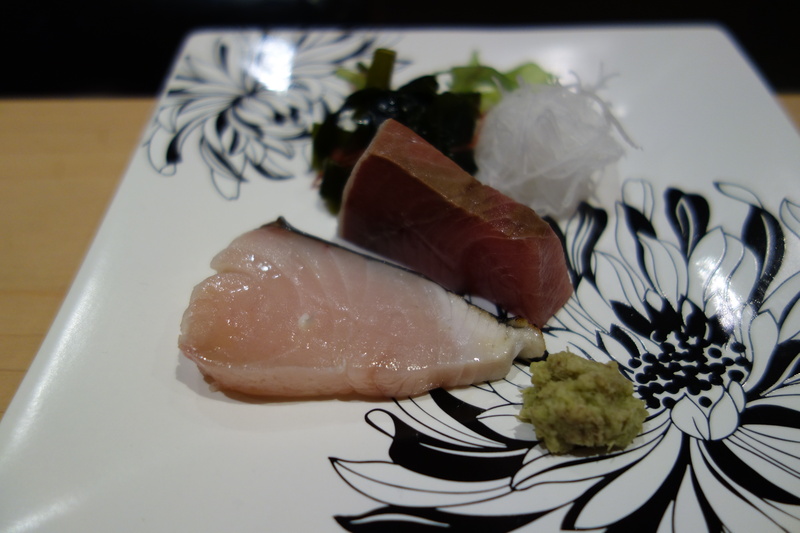 The keiji maguro had a sophisticated blend of fat and meat, the otoro-and-yolk maximized the onslaught of fat, a simpler taste. This was a pure luxury. 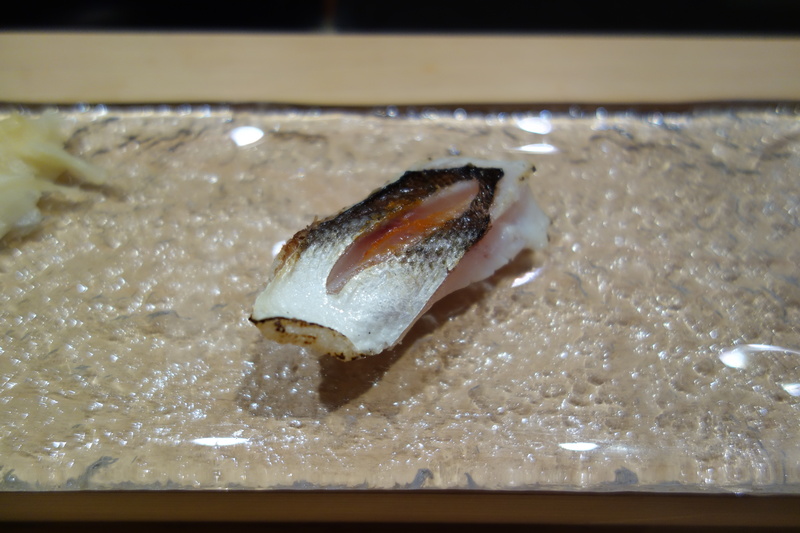 Tasted like amadai (tilefish), a clean salty whitefish taste, well done crispy scales. 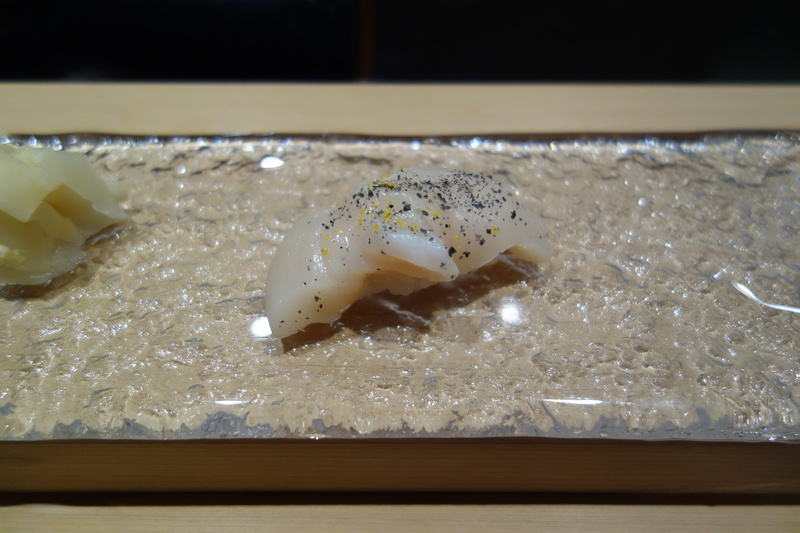 Not too appetizing, there was a strange smell of curdled egg white for the hotate, perhaps an interaction with the grated lemon. Very soft. 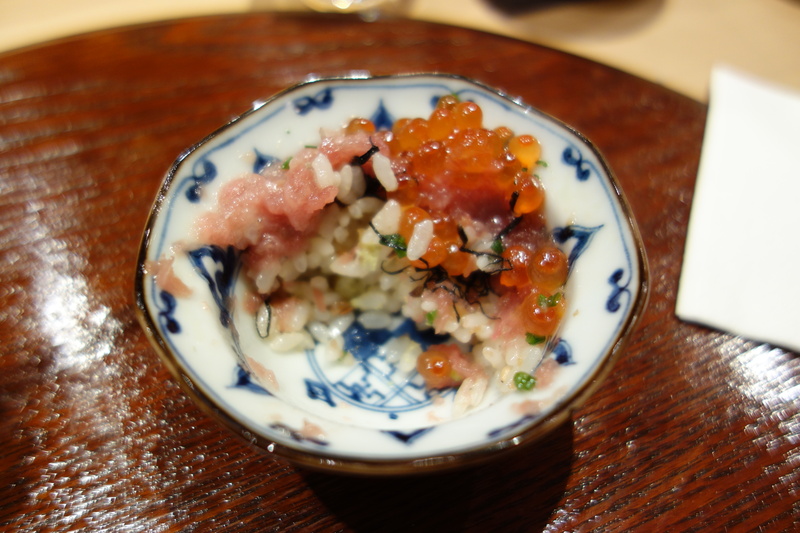 Rice, which is on the al dente side, contrasted heavily with soft texture of fish. 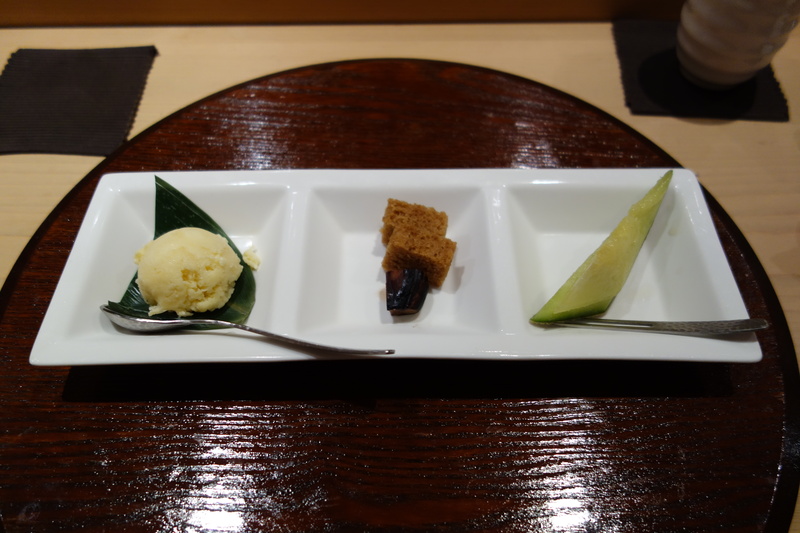 Tofu ice cream had a lot of ice crystals. 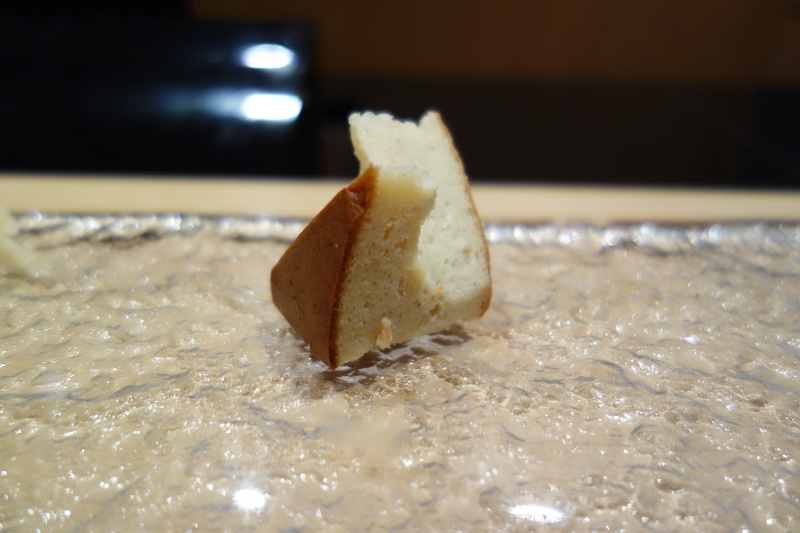 Ganzuki was a fairly standard cake. Melon was nice.